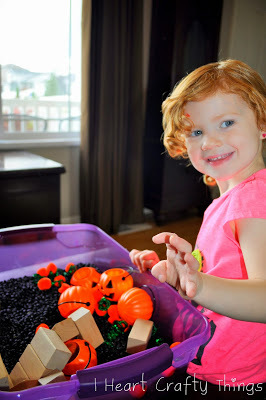 We traded in our apple books for pumpkin books at the library this week so I switched out our Apple Sensory Bin for Five Little Pumpkins. My daughter could not wait to get her hands on it. We kept our black bean base that we already had in the bin from our Apple Tree theme last week, so that made the transition really simple. 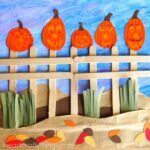 To keep with the Five Little Pumpkins theme, I placed five little pumpkin containers on a gate or fence. 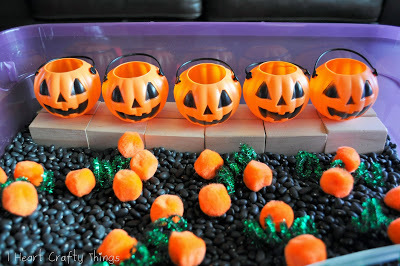 I found my little pumpkins at Walmart, but here are some on Amazon that look the same. For the fence I used some of our wooden blocks. 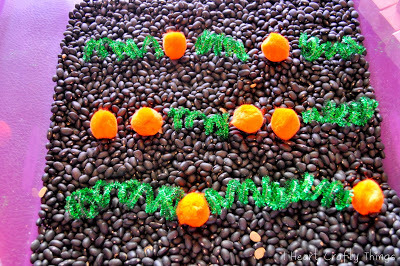 I made a pumpkin patch in the remaining section of the bin using orange poms and green sparkly pipe cleaners. Fold the ends of the pipe cleaners down so the sharp ends aren’t exposed and curl them around your finger. 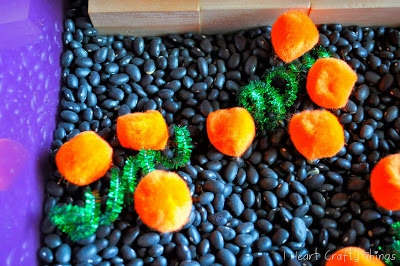 I placed them around the bin as vines and put the poms around them. 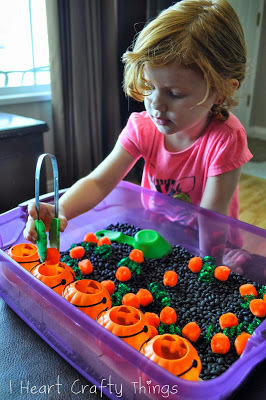 I chose to use 25 orange poms because as part of our play this week, I am going to challenge her to put 5 poms in every pumpkin bin to practice counting objects to 5. Add some tongs and a scoop and your little one is all ready to dig in. 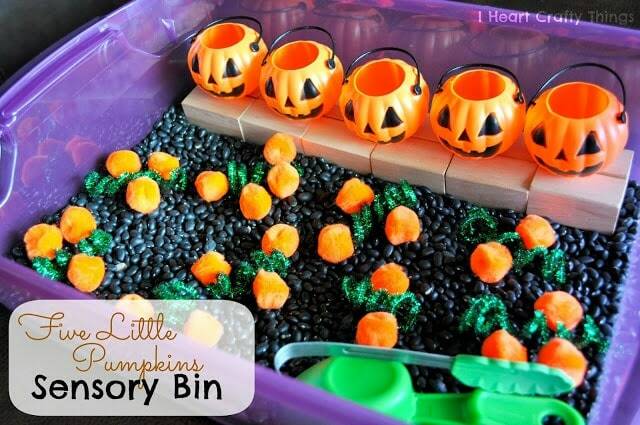 Your little one can practice moving the pumpkin poms into the bigger pumpkin containers. 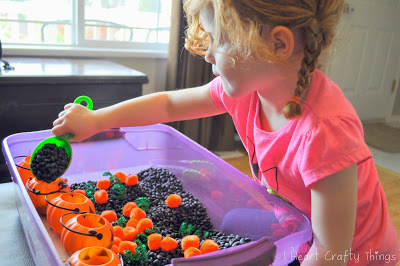 They can use the scoop to practice filling the pumpkins with the black beans. They can build a tall tower with their blocks to see how high they can get a pumpkin. And smile and laugh when it all comes tumbling down. 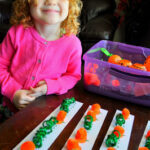 Or you can work on patterns with the pumpkin poms and vines. 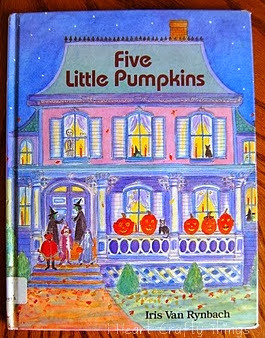 It’s a pretty popular Halloween story that is the well-known Five Little Pumpkins rhyming finger play in story version. just found this on Pinterest! What a CUTE idea! 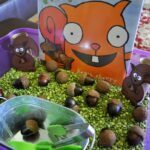 I am sure my 3 yo will LOVE playing with all those things and the book, too! Now, I just need to find those cute little pumpkin buckets! This is just fantastic. Thanks so much for sharing. I’m putting this together this week so I’ll be all set when October rolls around. I know my class of 2 1/2 yr. olds will LOVE this. You have inspired me! I am going out today to find my supplies. I have been racking my brain on what constructive thing I could do for my 5 hearing impaired students. 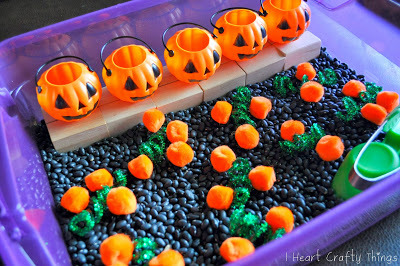 I am going to set up the apple and pumpkin sensory bin Monday. They are all new to me. We’re currently in love with that book. 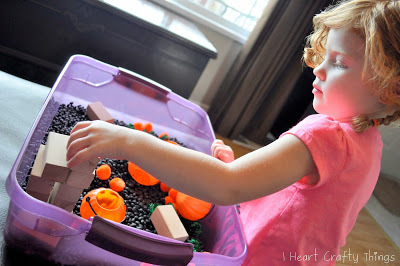 I need to try this sensory bin with my 3 year old. It’s such a cute idea! !